From the former honeymoon hideaway of Elvis and Priscilla Presley to Frank Sinatra’s iconic Movie Colony estate, Palm Springs is home to countless historic hotspots worthy of a visit. Below is a look at some of The Agency’s favorites. GAMBLE HOUSE - The winter residence of Ambassadors Walter and Leonore Annenberg, this historic midcentury modern estate, designed by Frederick Fisher and Partners, is the perfect place to while away an April afternoon in Palm Springs. Designed by landscape architect James Burnett and inspired by the Annebergs’ collection of Impressionist and Post-Impressionist paintings, the property showcases nine acres of majestic gardens with more than 70,000 drought resistant plants and trees. Free and open to the public from Thursday through Sunday, guests can enjoy guided walks, rotating exhibitions and breathtaking views of Mount St. Jacinto from The Center’s staggering great room. 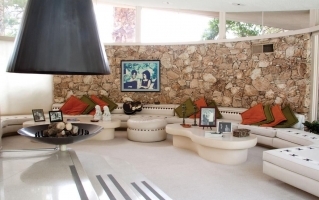 ELVIS HONEYMOON HIDEAWAY - Designed by modernist architect William Krisel and built in 1962, this midcentury time capsule near the foothills of Mount San Jacinto was the honeymoon respite of none other than Elvis and Priscilla Presley. Rumor has it the King of Rock and Roll carried his young bride up the home’s stairs while serenading her with “Hawaiian Wedding Song,” from his film Blue Hawaii. The couple’s daughter, Lisa Marie, was born exactly nine months later. Guided tours are offered daily. 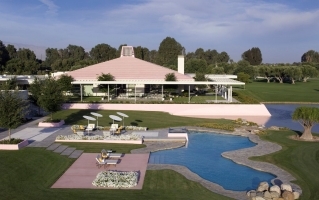 LAS PALOMAS - It was during one of Alfred Hitchcock’s visits to Las Palomas, Cary Grant’s storied Palm Springs estate, that the legendary filmmaker coaxed the actor out of retirement and into the role of a retired jewel thief named John Robie—”The Cat”—in To Catch A Thief. Last represented by The Agency’s Eric Lavey, the stunning Spanish retreat is as rich in architectural pedigree as it is Hollywood history. 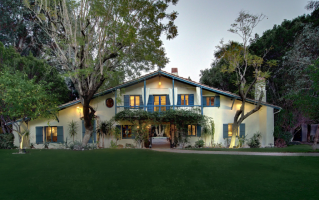 Built in 1930 by architect John Byers, an early pioneer of Spanish Colonial revival style in Southern California, the estate is an exact replica of a 19th-century Spanish Andalusian farmhouse. The home is private, however, it’s worth taking a stroll down the street if only to have a look at the property’s iron gates, which still bear Grant’s initials. 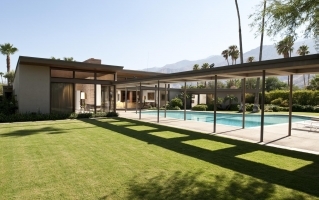 TWIN PALMS RESIDENCE - Located in the historic Movie Colony neighborhood of Palm Springs, this legendary Desert Modern estate is the former abode of Ol’ Blue Eyes himself. After making his first million, Frank Sinatra commissioned architect E. Stewart Williams to build him the ultimate Palm Springs abode. Rumor has it the crooner had his heart set on a Georgian-style mansion, but settled for the architect’s modernist vision instead. The house became the gold standard by which Hollywood measured desert dwellings, serving as a glamorous backdrop for many a twilight fete. The illustrious property is available for private tours, weddings and dinner parties. 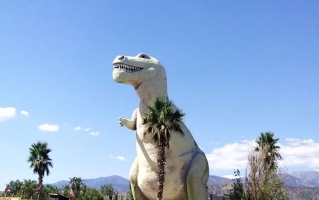 DINOSAURS - Regarded as one of the country’s most iconic roadside destinations, the Cabazon Dinosaurs have become synonymous with the drive to Palm Springs. Sculptor and theme park artist Claude Bell began constructing the creatures in 1964 in an effort to draw more customers to his nearby restaurant. He created his first dinosaur, Dinny, over the course of 11 years from spare materials salvaged from the construction of Interstate 10. The enormous, steel and concrete dinos, which featured prominently in Pee Wee’s Big Adventure, are now among the most Instagramed sites in the desert.